SINGAPORE — London-based Korean artist Do-Ho Suh was recently back at the Singapore Tyler Print Institute for two days to continue and expand the work he first did there in 2010. Suh is internationally-renowned for his large-scale fabric installations that explore the issue of cultural displacement. Thread, fabrics, and sewing have always played an important role in his practice. 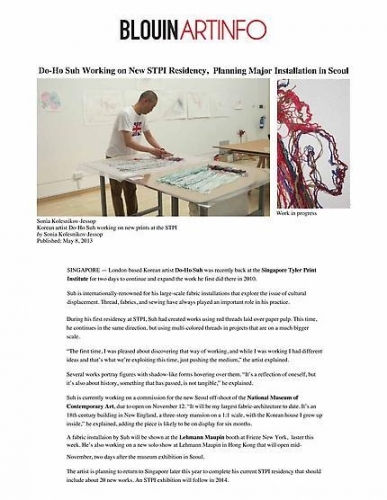 During his first residency at STPI, Suh had created works using red threads laid over paper pulp. This time, he continues in the same direction, but using multi-colored threads in projects that are on a much bigger scale. “The first time, I was pleased about discovering that way of working, and while I was working I had different ideas and that’s what we’re exploiting this time, just pushing the medium,” the artist explained. Several works portray figures with shadow-like forms hovering over them. “It’s a reflection of oneself, but it’s also about history, something that has passed, is not tangible,” he explained. Suh is currently working on a commission for the new Seoul off-shoot of the National Museum of Contemporary Art, due to open on November 12. “It will be my largest fabric-architecture to date. It’s an 18th century building in New England, a three-story mansion on a 1:1 scale, with the Korean house I grew up inside,” he explained, adding the piece is likely to be on display for six months. A fabric installaion by Suh will be shown at the Lehmann Maupin booth at Frieze New York, laster this week. He’s also working on a new solo show at Lehmann Maupin in Hong Kong that will open mid-November, two days after the museum exhibition in Seoul. The artist is planning to return to Singapore later this year to complete his current STPI residency that should include about 20 new works. An STPI exhibition will follow in 2014.